On Tuesday, April 7, Prairie’s 5th and 6th graders welcomed four authors from Milwaukee’s Boswell Books as part of the shop’s Middle Grade Mania book event. Organized by SRC Librarian McKenzie Weaver, students gathered with authors in Prairie’s theatre to learn about each writers’ process and were also treated to a short reading from each visiting author. The event was a great opportunity for students to learn how one’s passion for writing can turn into a lifetime career of exciting stories, novels, poems and endless possibilities! The Trap by Steve Arntson – It’s the summer of 1963, and something strange is afoot in the quiet town of Farro, Iowa. The science fiction inventiveness of Madeleine L’Engle meets the social commentary of Gary Schmidt in this thrilling tale of missing persons, first crushes, embarrassing pajamas, and thought-provoking dilemmas. The author is a musician in Seattle and also author of The Wikkeling. Genuine Sweet by Faith Harkey – Twelve-year-old Genuine Sweet, of tiny Sass, Georgia, can grant any wish . . . except her own. It’s a peculiar predicament, considering how much she could use a few wishes. Told in the engaging, irresistible voice of Genuine Sweet herself, Faith Harkey’s debut novel spins a remarkable tale of a small-town girl with big-time magic and an even bigger heart. Eddie Red Undercover: Mystery in Mayan Mexico by Marcia Wells – The fun and fast-paced second installment in the illustrated Eddie Red series. On vacation in Mexico, Eddie Red and his best friend Jonah must once again rely on Eddie’s talent for drawing and his photographic memory to uncover clues to catch a crook when Eddie’s father is falsely accused of a crime. Willie Maykit in Space by Greg Trine – Earth-dwelling fourth-grader Willy Maykit couldn’t be more excited about his school field trip to Planet Ed..But when Willy ends up being left behind on Ed can Willy, along with his classmate Cindy and an alien boy named Norp, outsmart the big hungry monsters until someone rescues them? Did you know Prairie’s SRC hosts a handful of events that encourage reading, research, writing and more? 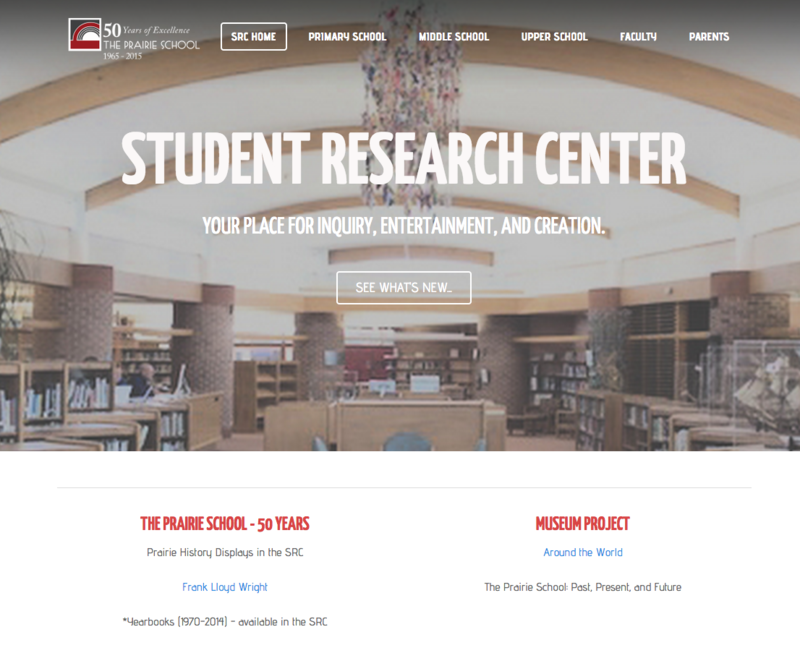 Launched this year, the SRC also has an updated website with great resources for students, parents, and teachers. Check out the latest blog posts, newsletter, and a list of upcoming events posted by our SRC librarians. This entry was posted in All News, Featured, Learn More About Prairie, Middle School by Communications Department. Bookmark the permalink.